If you’ve ever seen a photo of Lake Tahoe, it was probably of Emerald Bay, possibly the most stunning location on a lake surrounded by stunning locations. Emerald Bay State Park, which includes Emerald Bay as well as the land surrounding it, is a massively popular recreation area. It’s home to Lake Tahoe’s only island as well as a soft, sandy beach and historical home. 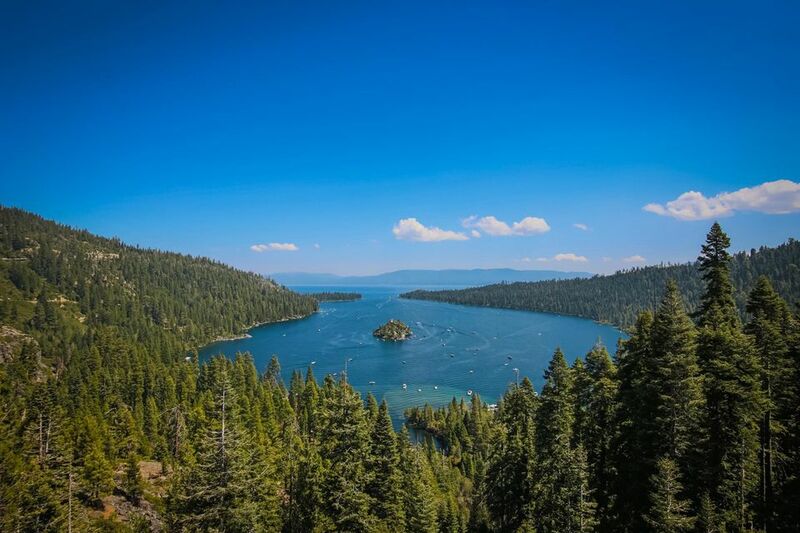 From easy, family-friendly hikes to kayak rentals and photo ops galore, Emerald Bay is a can’t-miss stop on any Tahoe vacation. It’s technically in South Lake Tahoe but is an easy drive from the north shore, provided the roads are open. Read on for our complete guide to Emerald Bay from how to get there to what to see and more. Lake Tahoe, split between Nevada and northern California, wasn't very well-known until the 1930s when Nevada legalized gambling. During the '40s and '50s, the area became popular with Hollywood’s elite, including Frank Sinatra’s Rat Pack as well as a few well-known mobsters and unsavory types. By the time the 1960 Winter Olympics were held at Lake Tahoe’s Squaw Valley Ski Resort, the area was well-known as a tourist destination for west coast families and outdoor enthusiasts. Emerald Bay State Park, on the California side of Lake Tahoe, was privately owned by a wealthy family until 1945, at which point the land and residence (known as Vikingsholm) were sold to a local philanthropist. That buyer later sold the land to the state for half its value, and California took over management of the land, designating it as a park in 1953. You’ll learn more about the history of the park if you take the Vikingsholm tour. Emerald Bay State Park is on the southwestern side of Lake Tahoe. If you’re coming from the north shore, you’ll take Highway 89 south. If you’re in South Lake Tahoe, you’ll take Highway 89 north. There are several places to park: in the parking lot for Eagle Falls ($5-$10, depending on season), in the parking lot for Vikingsholm ($5, self-pay in the winter), or along the side of the road, which is free, but only allowed from May to November. All three options fill up quickly, especially on summer weekends. Expect some of the best views of nature you’ve ever seen. Emerald Bay itself is stunning, with bright blue waters and the small Fannette Island beaconing boaters and cliff jumpers in the summer. If you walk down towards the water, you’ll be heading to Vikingsholm and the park beaches. If you walk away from the water and up the trails towards Eagle Falls, you’ll find stone walkways that lead to stunning views of Emerald Bay as well as Eagle Falls itself. You’ll know you’ve arrived when you start to see views of Emerald Bay, as well as the line of cars parked up and down the road. Even if you’re just going to the beach, you should wear sturdy walking shoes as you’ll have to walk down (and then back up) a 1-mile path that loses and gains about 400 feet of elevation. There are benches along the way and most people in reasonable shape should be able to walk the path without trouble as it’s wide and smooth. There are no rides or shuttles available down to the beach and Vikingsholm area. Fortunately, no matter where you park, you can walk to everything available. Eagle Falls: Walk to the end of the Eagle Falls parking lot and you’ll see the trailhead for Eagle Falls. A steep, but short, 15-minute hike takes you to an exposed, rocky area with fantastic Emerald Bay views. If you instead head to the left just past the trailhead for about 10 minutes, you’ll end up at the photogenic Eagle Falls, which has a wooden footbridge passing over it. If you continue on that trail, you’ll leave the park and enter into Tahoe’s remote Desolation Wilderness, a popular camping and backpacking site. In late summer, when the water is shallow, the area under the footbridge is used as an unofficial swimming hole. Beach: Walk down the 1-mile path from the Vikingsholm trailhead and you’ll end up at the Emerald Bay’s Beach. In the summer months (June-August), kayak and paddleboard rentals are available. Year-round, you’ll find indoor bathrooms, outdoor showers, and first-come, first-serve picnic and grill facilities. The beaches are sandy and soft and the water is shallow and warm, making it a great family destination. Vikingsholm: Continue just past the beach area and you’ll reach Vikingsholm, a private home-turned-museum next to the lake. Guided tours are available for a small fee (under $10) between Memorial Day and Labor Day. In those same months, you’ll find a small gift store and snack shop along with a very small visitor center. You can walk around the outside of Vikingsholm year-round, but access to the inside is allowed only with a guide. Drinking water is only available here during the summer months. Kayaking: Kayak rentals are available on a first-come, first-served basis Memorial Day to Labor Day. No reservations are taken and the operation is occasionally cash-only. Kayaks and paddleboards are available with rates ranging from $25 for a single kayak for one hour to $85 for a double kayak for the entire day. Get here early and be sure to bring an ID. Most people visit Emerald Bay in the spring, summer and fall (May-October are the best months.) Just south of Emerald Bay is a winding road with steep drop-offs, with Lake Tahoe is on one side and Fallen Leaf Lake is on the other. So while it’s a lovely drive without snow, it can be a bit slippery and avalanche-prone in the winter. As such, it get closed rather frequently from November to April during snowstorms. When the road is closed, there is no connection between the north shore and the south shore on the west side of the lake; the only open route is along the east side of Lake Tahoe. If Highway 89 is open during the winter, you can visit, but the lots are unplowed and the hikes and 1-mile walk down to the beach are unmaintained; you’ll almost certainly need snowshoes. Outside of the summer months, parking at Vikingsholm or Eagle falls is self-pay, which means you’ll need to fill out a small form and insert your parking fee in cash into the collection box. After heavy storms, the parking lots may be inaccessible. Parking on the road is never allowed between November and April. The bathroom facilities at both the beach and Eagle Falls are open year-round, though the portable bathrooms at the top of the Vikingsholm parking lot may be locked and/or removed in the winter.